Every house will have different bathroom dimensions accordingly to a certain house plan. There are no restrictions and only creativity of a designer, architect or homeowner will determine what measurements of rooms will be practical and suitable while designing the whole house. Typically three bathroom types are defined: half bathroom, 3/4 bathroom and full size bathroom. Each option might be characterized by its minimum required dimensions for proper fitting of all fixtures, while maximum sizes won’t have any certain limits. 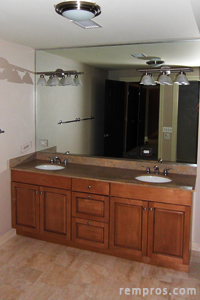 1/2 bathroom, also known as a powder room, with very often single sink vanity and standard toilet is the smallest option. Containing two bathroom plumbing fixtures is definitely not a factor of a size determination, but a whole meaning of such room is compact with no shower or bathtub. 1/2 bath usually has to be at least 3 x 6 feet with 24” – 28” wide pocked door in the middle of one of the longest wall. Such tiny powder room typically suitable for a smaller 18” – 21” in width vanity or pedestal sink on one side and toilet on the other. Some 1/2 bathrooms might be bigger, but usually does not exceed 7 feet in length otherwise the space won’t be used rationally and remained as open wasted area. 3/4 bathroom has vanity, toilet and a shower. About 35 square feet will be sufficient for accommodation of compact to medium vanity, up to a 42” x 42” shower and toilet. Installing spacious shower and bigger double sink vanity will consume more space and the whole bathroom has to be extended to adequate dimensions allowing a proper fitting of all desire fixtures. Average 3/4 bathroom is about 6’ x 6’, but larger sizes might be a good option for convenience. Full size bathroom with separate 36 x 36 inches shower, standard 5 feet wall to wall bathtub, 60”W x 21”D x 36”H vanity and regular toilet has to be at least 50 ft² big. Shower / bathtub combination typically require less space. In addition, it is very popular option for many condominiums or smaller single family houses. Even though, there are no separations and practically you are taking a shower inside the bathtub it still counts as a full bathroom. Very often 6’ x 6’ room will be a perfect for a standard tub/shower combo, medium vanity and toilet with no space wasted. How big the bathroom should be will mainly depend on family requirements and practical use. On average a 1,900 – 2,100 square feet three bedroom house will have 2 full and 1 half bathrooms. Master bedroom will typically have a large bathroom which might be as big as 120 ft² and have a spacious hot tub along with a roomy shower. Second full size bathroom with a tub/shower combination and actual dimensions 7’ x 5’ will be a perfect option for sharing in between family members who occupy other two bedrooms. Compact powder room close to kitchen and dining room might be very thoughtful to plan for convenience while preparing a food or inviting friends for a dinner.